A single-vehicle crash on Neer City Road last week resulted in a fire that spread to surrounding vegetation after the motorist veered off the road to avoid an animal. Columbia River Fire and Rescue crews responded to the crash just after 9:30 p.m. on Friday night, May 25. The SUV's engine compartment caught fire as a result of the crash. CRFR volunteer coordinator Jennifer Motherway said crews were dispatched at 9:34 p.m. and Division Chief Eric Smythe was on scene within minutes of the dispatch. 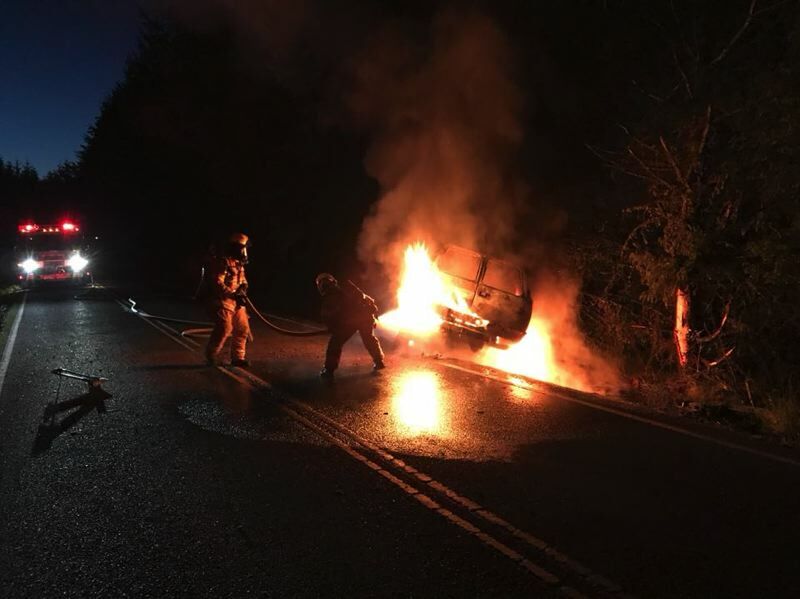 When Smythe arrived, the SUV was engulfed in flames and the driver was already out of the vehicle and was being helped by someone in another vehicle roughly 200 feet away, Motherway stated. The driver, who was the sole occupant of the SUV, reportedly swerved to avoid hitting a deer and crashed into a tree on the roadside. Flames from the vehicle spread to nearby trees, but fire crews were able to put out the blaze in less than 20 minutes. One lane of the roadway was blocked for a period of time following the crash. The driver of the vehicle was evaluated at the scene and declined transport to the hospital. The driver was not identified.